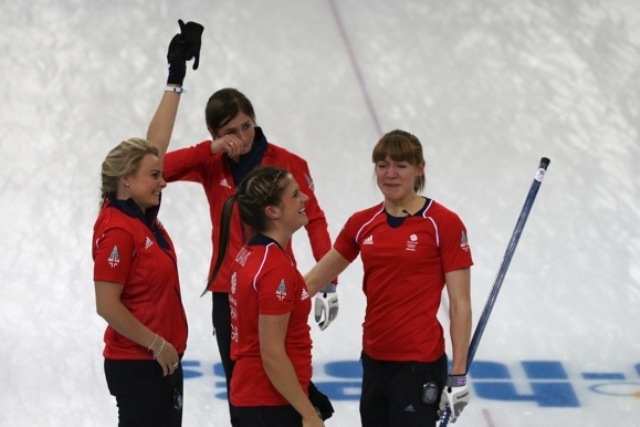 The Great British team of skip Eve Muirhead, third Anna Sloan, second player Vicky Adams and lead Claire Hamilton, supported by alternate Lauren Gray, team coach David Hay and national coach Rhona Howie, took Olympic bronze medals with a 6-5 win over Switzerland on Thursday afternoon. Switzerland opened the game with last stone advantage and blanked the first end before scoring two points in the second end when their skip Mirjam Ott tapped out a Scottish stone to leave another of her own stones as well as her own shooter, for a 2-0 lead. In the third end, Britain opened their account when skip Eve Muirhead drew her last stone inside two Swiss counters to score one point. The Swiss then restored their two-point lead when Ott drew her final stone of the fourth end into the four foot ring to score one point, for a 3-1 lead. In the fifth end, British skip Eve Muirhead played a double take-out with her first stone and followed that up with a nose-hit to score two points and level the game at 3-3 at the half-time break. Switzerland had an accidental nose-hit in the sixth end when they were looking to blank, but could only score one point for a 4-3 lead. After this, Britain blanked the seventh. They then scored two points in the eighth, when Ott missed the second British stone in a double take-out attempt to allow Muirhead a simple draw with her final stone for two points and a British lead for the first time in the game, at 5-4. When Switzerland’s Ott came to play her last stone in the ninth end, she was facing three British stones already sitting in the house, and she was forced to draw her stone inside the four-foot ring to score one point and level the game at 5-5. Now with last stone advantage, the British team controlled the tenth end and eventually Muirhead drew her final stone onto the button to score one point, win the game by 6-5, and take the bronze medals. Team coach David Hay was also pleased to win bronze. He said, “yesterday was a massive disappointment, but total respect to the girls, they got it together overnight and came back today to play a great game against a good team. We came with one aim, and that was the gold medal, but today is a great consolation. It’s not the one we came for, but an Olympic medal is the ultimate achievement”. He added, “It took us to the eighth end to get real pressure on - in the ninth end Mirjam played a great shot and in the last end, Claire got both her ticks and it meant that the rest of the girls could play a normal end and Eve had a great shot to win”. This is only the second women’s Olympic medal for Great Britain, to follow on from the gold medal won at the Salt Lake City Games in 2002. Bronze medal for the GB Olympic team of Eve Muirhead, Anna Sloan, Vicky Adams and Claire Hamilton, supported by Lauren Gray and team Coach Dave Hay. Rhona Howie as National Coach. WELL DONE! "Eve Muirhead held her nerve and those icy blue eyes can now light up. Emotion in the stands, in the coaching team and on the ice. A brilliant second half of the match. It has been hard at times, it has been emotional, but they deserve that. "A sad day for Swiss skip Mirjam Ott who finishes fourth two Olympics in a row. The British team came here as a young team full of potential, they were one of the favourites to win a medal. To play so well against the Swiss team is absolutely brilliant."